Lyrical and dreamlike, playful and sublime, PANDORA'S BOX takes the iconic 80’s band into strange new worlds filled with Spy music, Tarzan movies, Debussy, and their signature brand of deadpan funk played by a band Gil Evans would have loved. 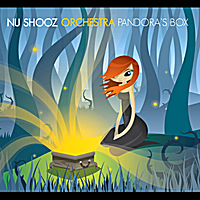 More than two decades after their 1986 Top Ten Hit single, “I Can’t Wait,” took the world by storm, NU SHOOZ returns with a new album, “Pandora’s Box”, and a 10 piece orchestra Gil Evans would have loved. Formed in Portland, Oregon in the summer of 1979, their line-up has changed over time, but in all its various forms, they’ve always pushed the boundaries between pop, funk, and jazz. Now, with the release of Pandora’s Box, Portland’s favorite soul explorers take one giant leap for mankind with a brave new sound, combining their signature brand of funk with elements borrowed from Film Noir, ‘60s Spy Movies and even Tarzan. Since the ‘80s Day and Smith have both had unique and varied experiences. Day has been performing and recording jazz (www.valeriedaysings.com), and created “Brain Chemistry For Lovers”, a combination concert, cabaret and science lecture that explores the neuroscience of Romantic Love (www.brainchemistryforlovers.com). Smith has been a composer and arranger - scoring indie films and hundreds of commercials (www.malcocreative.com). NU SHOOZ was nominated for a “Best New Artist” Grammy award in 1987 and earned a Gold Record for the album “Poolside.” Their breakthrough hit, “I Can’t Wait” continues to be played on radio stations around the globe every 11 minutes. The band has been featured on MTV, VH1, and classic music programs like American Bandstand, Solid Gold, and the UK’s Top of the Pops. They’ve toured with some of the biggest names in show business, including Tina Turner, Billy Ocean, and the Pointer Sisters. Thanks; D. Hamilton, Malcolm Smith, Lance Limbocker at Downstream Sound, Greg Lee, Kevin Welch and All Shooz Past, Present, And Future. This album is dedicated to Fritz Richmond. Valerie Day and John Smith burst onto the pop scene in 1986 as the duo, NU SHOOZ, with the hit single, “I Can’t Wait”. In the meantime, Day and Smith, have continued writing, performing, and teaching music while expanding their name to NU SHOOZ Orchestra. Their current pop-jazz blend is now available on the aptly-named Pandora’s Box. It is aptly-named because the Pandora’s Box project goes from 60’s spy theme flavor to straight vocal jazz to light pop-funk grooves. Even with its genre sweep approach, the disc is focused on fun sounds and you can feel that.